A new HEPI report, The invisible problem? Improving students’ mental health, shows a majority of students experience low wellbeing, that depression and loneliness affect one-in-three students and that the number of student suicides has risen. The report calls for extra support from universities and the NHS. ‘Mental disorders are most common in young adults, just at the age when many people become students. Going to university can be stressful, especially for first-in-family students. Typically, you lose your established support networks, move to a new part of the country and take on large debts. Occasionally, it even ends in tragedy. ’So it is vital that people entering university for the first time know that support is available, that any problems can be shared and that asking for help is normal. University support services, academic tutors, student unions, other students and the NHS can all help. ‘A majority of students experience low wellbeing and over one-in-ten have a diagnosable mental illness. The scale of the problem is bigger than ever before. ‘Yet support is hard to access, universities often underfund their counselling services and the NHS does not recognise how vulnerable students are. In particular, there is often no consistent care between term-time and holidays. We need to tackle these problems. We also need to avoid making the problem worse by over-protecting students because avoiding difficult situations can be counter-productive. ‘Today’s higher education students undergo many challenges. 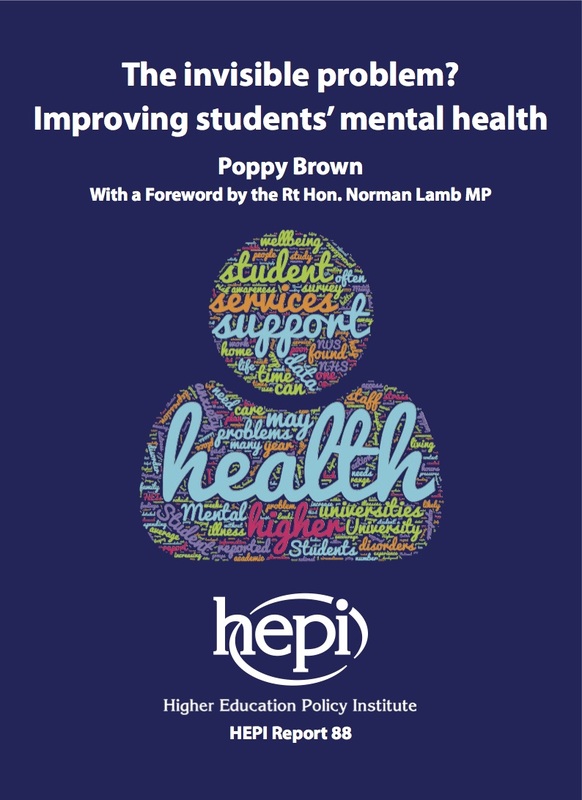 I am delighted that HEPI is concerned for the mental wellbeing of HE students. This report outlines many of the difficulties facing students that may affect their mental wellbeing. ‘Universities, government and the NHS have a collective responsibility to rise to this challenge. It is crucial that we start more open conversations about mental health on campuses to break down the stigma, support students to build up their emotional resilience, and enable more people to seek support from counselling and other mental health services when things get tough. Survey data show many students are less happy and more anxious than the general population, including other young people. In most cases, full-time first-degree students are living away from home for the first time and lack direct access to their key support networks while facing new challenges. These include different ways of learning, tens of thousands of pounds of debt and uncertainty over the future. Many universities have effective support services in place but demand is not being met in full. Funding is limited and some students slip through the gaps. Students with severe mental illnesses lack continuity of care between home and university. Waiting lists for specialist services are long and national funding is biased against students and against mental health. funding mental health research so that the new Office for Students (OfS) and other bodies have robust data on the prevalence of mental health problems among higher education students. HEPI will be hosting events on student mental health with UPP at the Labour Party Conference on Monday, 26 September 2016, with guest speakers Paul Blomfield MP and Professor Janet Beer, and at the Conservative Party Conference on Tuesday, 4 October, with the Rt Hon. Nicky Morgan MP and Professor Koen Lamberts. For more information, please contact: harry.padfield@lodestonecommunications.com. The Higher Education Policy Institute’s mission is to ensure that higher education policy-making is better informed by evidence and research. We are UK-wide, independent and non-partisan.